Just like pie charts, doughnut charts help show the relationships of parts to a whole with each ring corresponding to a data series. Doughnut charts can help turn your data into an easily digestible piece of data visualization your readers or audience are sure to appreciate. 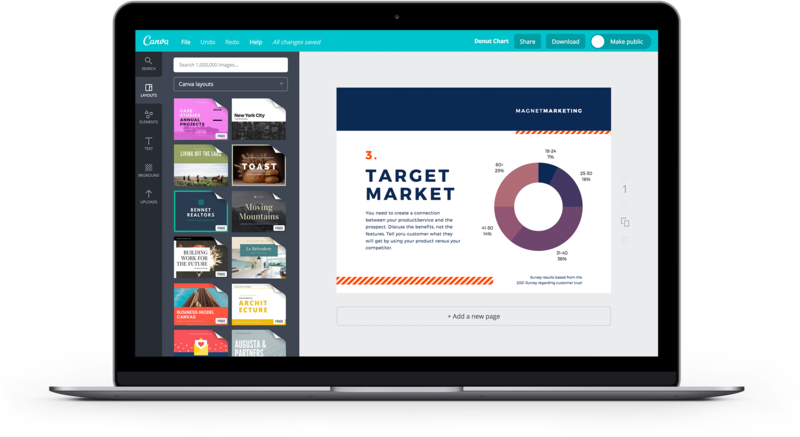 Canva’s graph tool can help you build one easily. Simply input your data into the provided table and sit back and watch as Canva creates your doughnut chart for you then customize fonts and colors. Using Canva’s drag and drop features and an amazing library of graphic elements, the perfect design is just a few mouse clicks away. Create a new Canva account to get started with your own doughnut chart design. Get started with your doughnut chart design by choosing from the available templates under the Charts pane. Click on the “Data” button found on the toolbar to bring up a table with some default values. Replace these values by typing in your own data set or copy and paste from an existing sheet. Make sure your readers or audience can clearly understand your chart by adding labels and a legend to your design. Use the text tool to create labels and choose from over a hundred fresh fonts to match your document or slide format. Colors can also be easily customized using the color wheel tool. Just select from any hue in the wheel or type in a specific hex code. Need a colleague’s input or missing some data? Give your teammates editing access by clicking the “Share” button, inviting them to edit your design and sending them the link. Since Canva is fully online, your colleagues can access your design from any computer, iPhone, iPad or Android device.